The journey from idea to publication is never a straight line. Author Dina Rae can certainly relate. Help me in congratulating her on the release of her new book Halo of the Nephilim and read about her publication tale. My experience in the writing process has been a roller coaster ride. My first novel, The Last Degree, was picked up by an unscrupulous publisher last year. There were so many problems-editing, posting it on distribution sites, formatting, etc. I could go on forever. It was the absence of royalty checks that prompted me to exterminate the contract. I put the book up on Amazon as a self-pub Kindle Select deal. I have no complaints with Amazon. My second novel, Halo of the Damned, and the sequel, Halo of the Nephilim, are traditionally published. To be honest, the experience is really a disappointment. I don’t want to be negative because the publisher does pretty much what most small/medium publishers do-very little in terms of advertising and promotion. What can I say-I’m a rookie who is learning. I have not been in this business long enough to give anyone advice, but I will say this: Don’t put all of your eggs in one basket. Her latest novel, Bad Juju, is about an old Haitian bokor who mentors two teens in the dark arts. A unique blend of horror, romance, and literary fiction meant for adults and mature teens. Can a fallen angel, his band of broken souls, and nephilim children change the world? Armaros the Cursed, Satan’s favorite of the Fallen, falls once again after breaking the rules. Fearing an eternity of punishment, he desperately attempts to save himself by sending a bird to his island. The SOS message is received by his beloved congregation. Can these loyal worshipers rescue him from the pit? 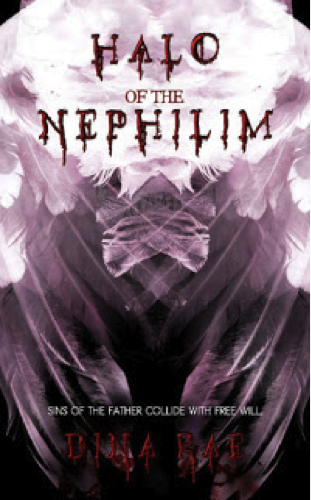 Halo of the Nephilim is the sequel to Halo of the Damned. The story begins with Armaros’ arrest. Declared dead, his only known surviving daughter, Joanna Easterhouse, proves her relation and inherits everything. She catapults her career from an entry-level advertising assistant to the head of Armaros’ advertising empire. She should be on top of the world, but knows everything good must come to an end. Joanna’s sister, Kim Easterhouse, marries Sean Slattery. Joanna generously includes them as key players in her advertising chain. They, too, have much to smile about, but a string of events leads them back to old family secrets. Wickedness looms over the Easterhouse family once more, forcing them into an unlikely showdown filled with page-turning excitement. Like Halo of the Damned, Halo of the Nephilim is filled with conspiracy and angel lore taken directly from scripture and other ancient writings. More mind control themes top off this tale of doom. Dina Rae delivers the darkness in the most entertaining light. I’ve read the Halo series up to the latest book and also read the novella Halo of the Madonna. 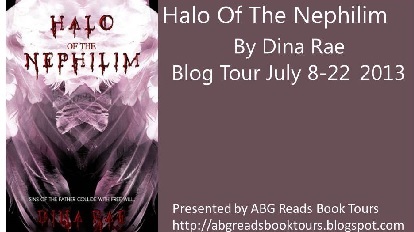 I can say that I love Dina’s Nephilim series and would love to read more! Good luck with your tour Dina!! It’s definitely a read that’s out of my usual stride, but that’s a great thing, isn’t it? I’ve heard a lot of horror stories about traditional publishing, but you hear a lot of flubs with indie publishing as well. Good for you for keeping your mind open! Good luck on your blog tour!